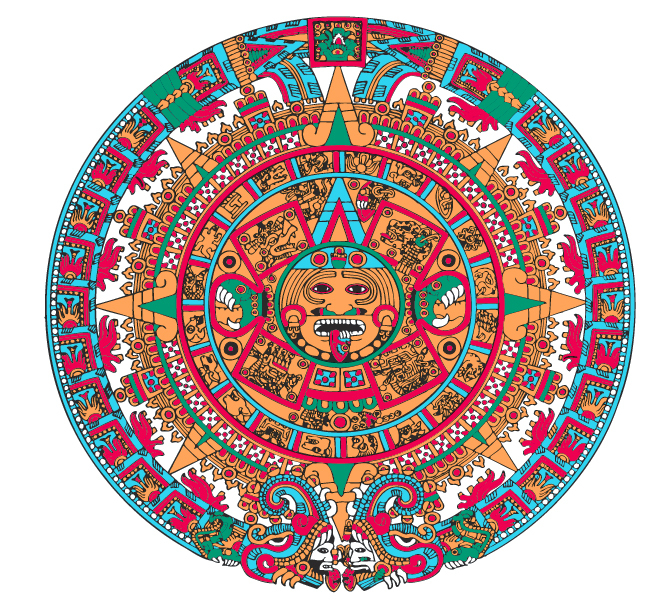 Known as the Stone of the Suns, a stone disk 12 ft. across weighing 24 tons, this monumental work isn’t really a calendar but a complex hieroglyph of the Aztec cosmology. 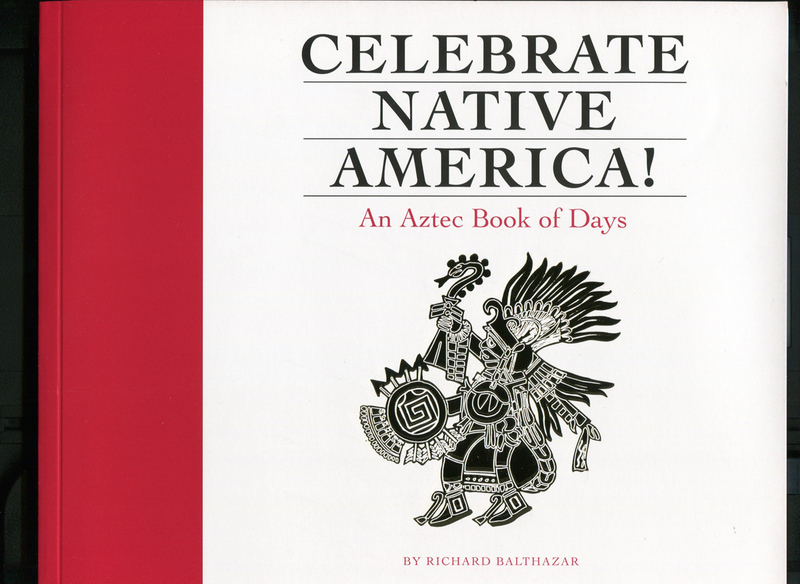 The book presents the Aztec ritual calendar, the 260-day sacred Turquoise Year, which was used for divination and prophesy, in color plates of their 13 ‘months’ of 20 days spread over 20 ‘weeks’ of 13 days. My weekly illustrations also include their patron gods or goddesses in images based on surviving Aztec books, primarily the Codices Borbonicus, Borgia, Nuttall, Fejervary-Mayer, Kingsborough, and Vindobensis. 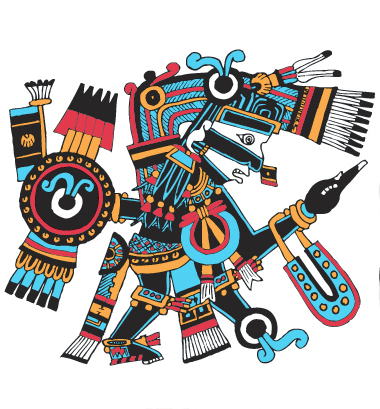 Tezcatlipoca, the Smoking Mirror, was the Aztec lord of the night sky, controlling human life for good and ill. He was the god of magicians and of the North. 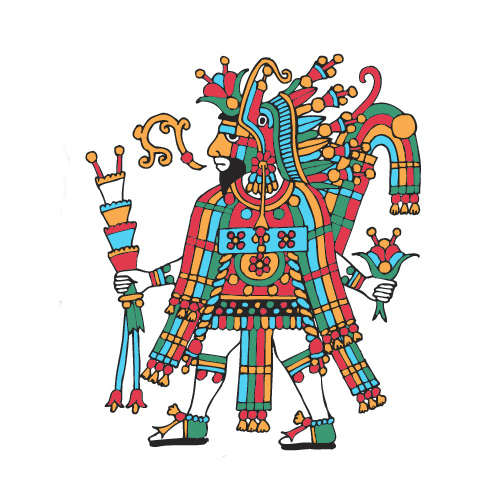 In myth, he created the First Sun by pulling the Earth Monster out of the primal waters, losing his foot in the battle, and in Teotihuacan he was the nemesis of Quetzalcoatl. The Turquoise Year was an evolution of the earlier Mayan calendar of similar structure with roots among the even earlier Olmec. It was the ancient Mesoamerican horoscope. The birth day-name was a person’s ceremonial and official name, and the deities who ruled the numbers, days, weeks, and months, each with light and dark sides, controlled individual and societal fates. The book also explains the similarly complex Aztec ‘century’ count of 52 years in four periods of 13 years. By the way, you can quickly find out your Aztec name by going to azteccalendar.com, and while there, you can even pick up your Aztec horoscope, which I admit will be much more detailed than what you’ll find in my old book. READERS: Please disregard the final chapter and its mind-boggling concordance. My hubristic attempt to start up a new Sixth Sun at the fall of Tenochtitlan was at best poetic, but that calendar has now run out anyway. Forget about it. Another note: I exercised my artist’s license on the 20th week, One Rabbit, naming as its patron a far more appetizing deity, Xochipilli, the Prince of Flowers. The actual patron was a quasi-deity called Tecpatl (Flint—the sacrificial knife). Feeling like a nagual (or bodhisattva) of Xochipilli, I’ve dared to use his image in the banner on this website.